Autumn is hanging on by its fingernails here in California. We’re still having gloriously sunny days (with the odd showery one), and cool nights. It’s a very short season, being only about 4 – 6 weeks long, so I don’t think it will be more than another couple of weeks before I’ll be wanting to light the fire in the family room. However, as yet, it’s not too late to be eating salads. There’s nothing quite like a looming deadline for motivation! 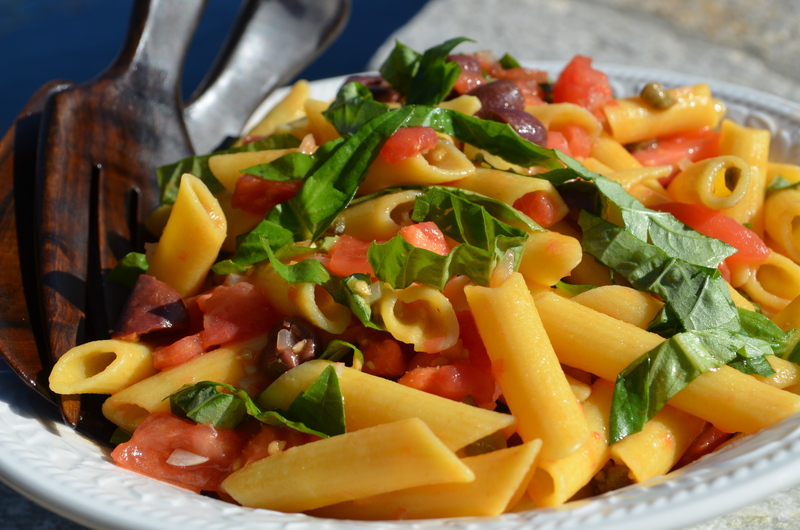 This is a salad version of Pasta Puttanesca. Gluten free vegan pasta salad. Cook the pasta in plenty of salted water according to packet instructions, until just cooked, but not fragile. While the pasta is boiling, use a sharp knife to make a small gash in the skin of each of the tomatoes; use a slotted spoon to add the tomatoes to the boiling pasta water for about 60 seconds each, so that their skins start to peel back from the gash. Remove the tomatoes from the boiling water with the slotted spoon, and peel off (and discard) the skins (which should pretty much slip off on their own). When the pasta is cooked, drain it, and toss gently in a large bowl with the olive oil. Check for salt, adjust if necessary. If your stomach can stand it, you can drizzle this with a little more olive oil. Refrigerate until required (this can help the flavors develop), but no more than about an hour, as you don’t want the basil to go brown. It was a hot day, today. Humid too, so I couldn’t mess with the oven even though I’ve been working on a new bread recipe this week (my freezer is getting quite full, since I’m making the stuff faster than my diet will let me eat it). 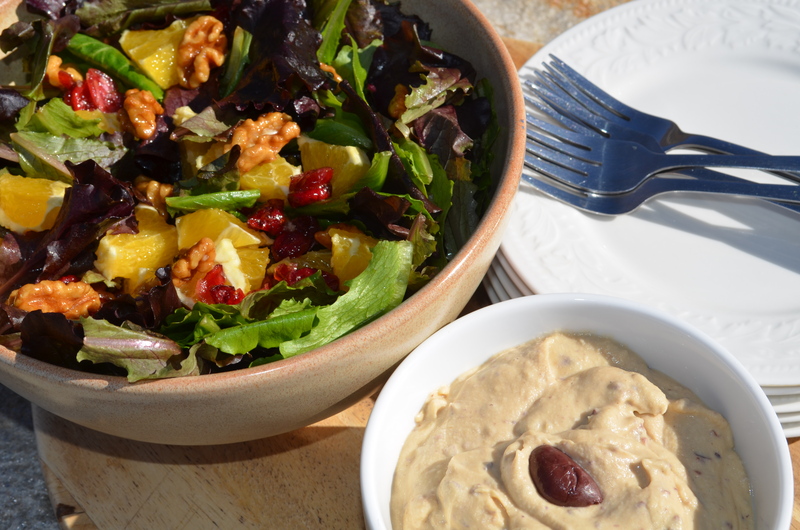 However, it was a good excuse to trot out another salad recipe, and I do need more salads. Now, I’m not so keen on raw broccoli, but anywhere from lightly steamed to soft works well with me and mine. If you happen to like raw broccoli, then feel free to skip the broccoli cooking step. This salad is quick to make, and pretty substantial. It’s slightly tangy, slightly sweet because of the cranberries, and a nice mixture of crunchy (pinenuts and broccoli) and chewy (cranberries). The lettuce dilutes the pretty strong flavors of the other ingredients. Click the picture to get a close-up! In a large saucepan, bring 1/2” water with the salt to a boil. Add the broccoli florets, cover, and steam for 2-3 minutes until the broccoli just starts to turn bright green, but retains some bite in the stems. Drain the broccoli very well (to stop the water from diluting the dressing – cooling for 1/2 hour in a colander works). Combine the salad dressing ingredients in a large salad bowl. 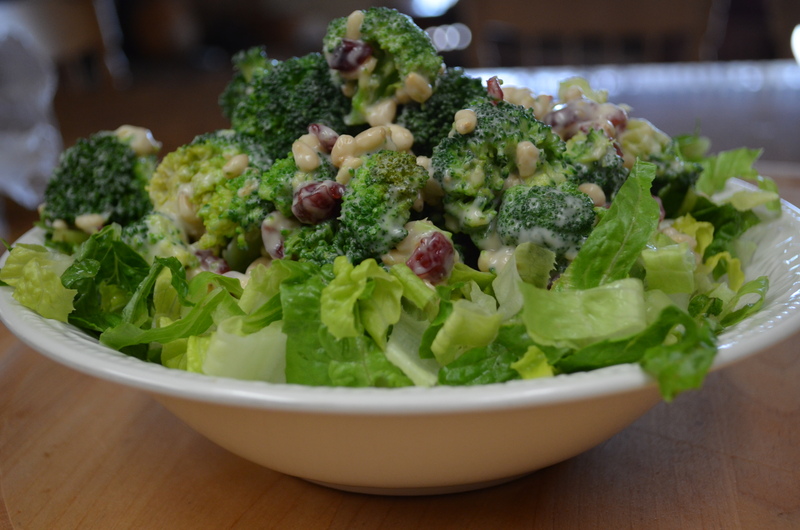 Add the steamed broccoli, dried fruit, and nuts and toss to combine. Serve immediately on a bed of shredded lettuce. I thought this mixture up while lying in bed wondering what to make my daughters for school lunch, taking into consideration that it was going to be hot today. They’d already had rice salad this week, and anything that involved using the food processor was out, because everyone else was still asleep. 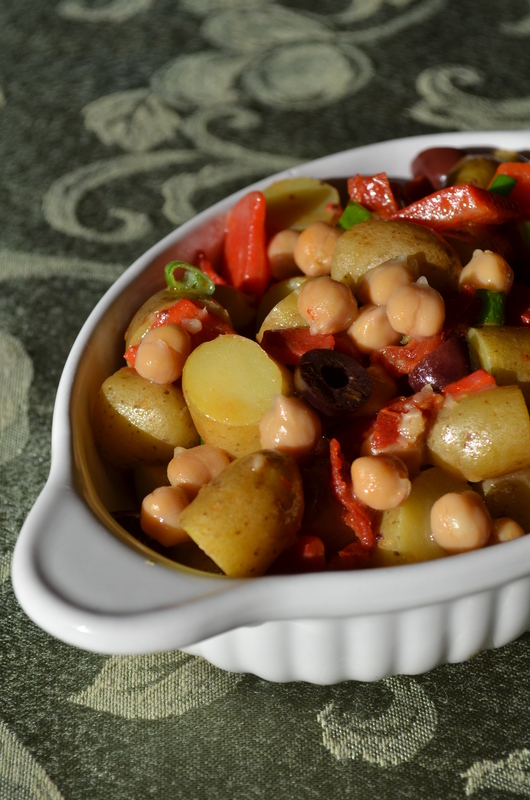 What I ended up with was a robust salad (man enough to stand up to the 3 or 4 hours of back pack storage), with an interesting balance of piquancy (from the olives and roasted red peppers) and mild heartiness from the potatoes and garbanzo beans / chickpeas. If you want to make this vegan, try substituting agave nectar or maple syrup for the honey, and use a different mild flavored mustard (check for wheat at the same time as checking for honey). 1/4 cup minced sun-dried tomatoes (drained). Wash the potatoes, then cut into halves or thirds to get even sized pieces (~1/2″ – 3/4″ across). Boil in lightly salted water until just cooked (but not so soft that they’re falling apart). 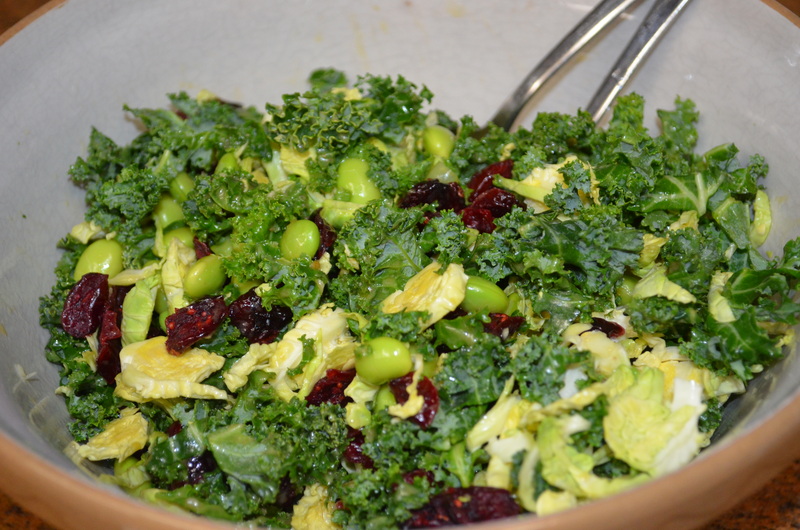 Beat together the olive oil, vinegar, garlic, honey mustard, and honey in a salad bowl. Stir in the garbanzo beans. As soon as the potatoes are cooked, drain them, and add to the salad dressing. Allow to cool. Stir in the remaining ingredients; chill and serve.